Today is Video Games Day, and it’s making me very nostalgic for some of my all-taime favorite games. I’m not a big list guy (as it’s too hard to narrow favorites down), but in honor of the day, I wanted to share a few thoughts about some of my favorite games and why they are special to me. This is one thing I’m sure of–Super Mario Bros. is my favorite game of all time, and in my opinion, a perfect video game. I will never forget getting an NES for Christmas the year it came out, and brining it to my gandparents’ house with me. As soon as I could, I snuck upstairs into my grandparents’ bedroom and hooked the NES up their little 12-inch TV, where I played for hours. Super Mario Bros. is a game I ahve revisitewd countless times over the years, and it will never get old to me. My first console was the Atari 2600, and my love for Activision began with the great games they put out for that console. River Raid, Kaboom, Keystone Capers, Fishing Derby, Megamania–the list goes on. But Pitfall is the one my memories are tied to the most. 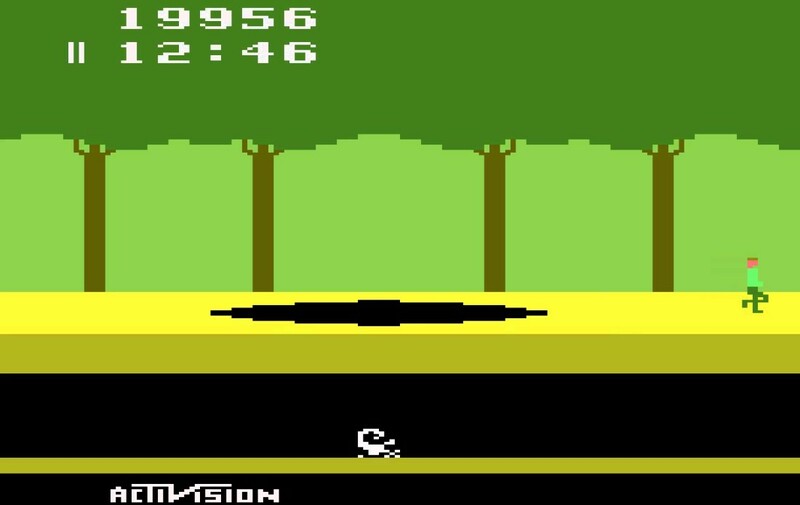 I remember my friend Doug and I sitting in my bedroom playing Pitfall for hours and hours. The fact taht you could go either right or left from the start screen was amazing in and of itself, not to emntiont he fact that each screen had an upper and lower level. Pitfall is another game you can pick up to this day and immediately have fun with. I love golf games, and this golf game is my favorite. PGA Tour ’96 from EA Sports was probably my most-played game on the original PlayStation. I had been playing EA golf games since the Genesis days, but ’96 feature the TPC at River Highlands, a course in Connecticut that I had been to many times. For a solid two years, I played this game almost every night with my friends. If EA re-released it today I would buy it ina second. This was actually my most-played game on the origianl playStation. I’ve never been a huge fighting game guy, but Tekken 2 sucked me in and made me a fan. Between the cutscenes that were mind-blowing at the time, to the amazing roster, to the near-perfect gameplay, this will always be my favorite fighting game. My favorite characters? Armor King and Lei Wulong. To this day, Crackdown is my favorite game on any Xbox console. The fact that it is stiull not backward compatible, and the new Crackdown was delayed again, are super frustrating to me. One of my closest friendships was built around this game. The progressions system is amazing, as you go from an average joe to a superhero over the course of the game. The action gets insane at times, and they city is a blast to traverse. If the new crackdown captures the feel of the original, it will have been worth the wait. So that’s just a quick list of some of my all-time favorites as we celebrate Video Games Day today. Tell us about some of your favorite games in the comments, or hit us up on twitter @CoOpCritics!